In continuing this series for 5 on Fridays it’s only fitting I do a pink round up for you guys for Valentine’s Day. Hot pink is kinda the unexpected color for Valentine’s Day. Where so many people flock to ballet shades of pink or bright reds, hot pink is the red headed step child longing to be worn. 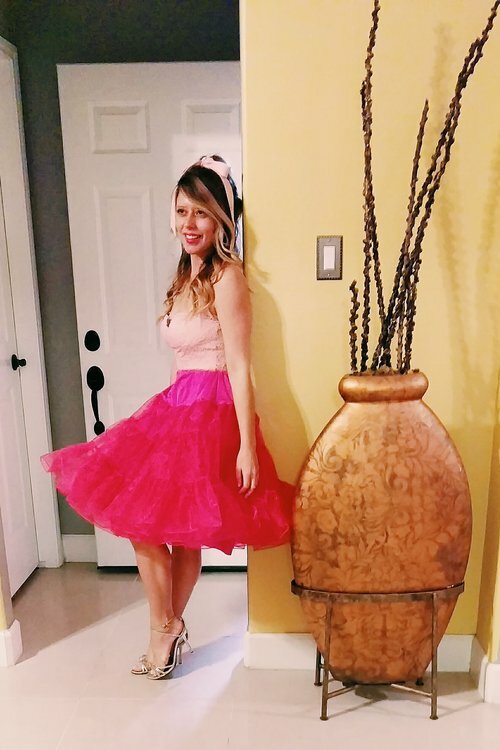 Last week I shared a round up of What to Get Her for Valentine’s Day which included a bright fuschia/magenta shaded dress. I went back to the archives to pull out five looks from picnic to a fancy dinner out all for your inspiration! 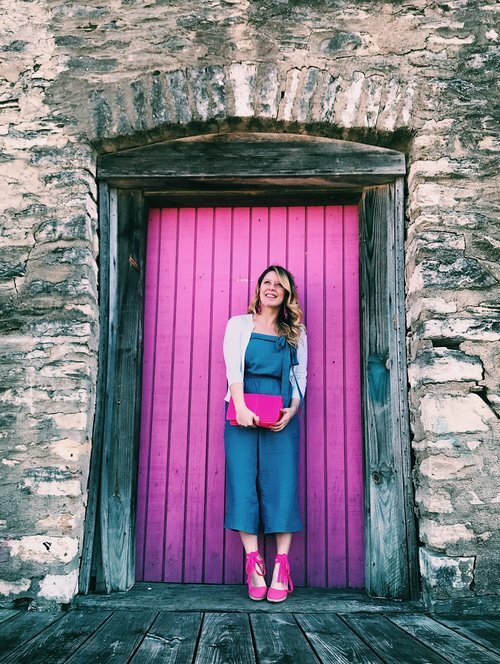 Hot pink is a perfect compliment to a chambray shirt, dress (love this Draper James version) or jumpsuit. 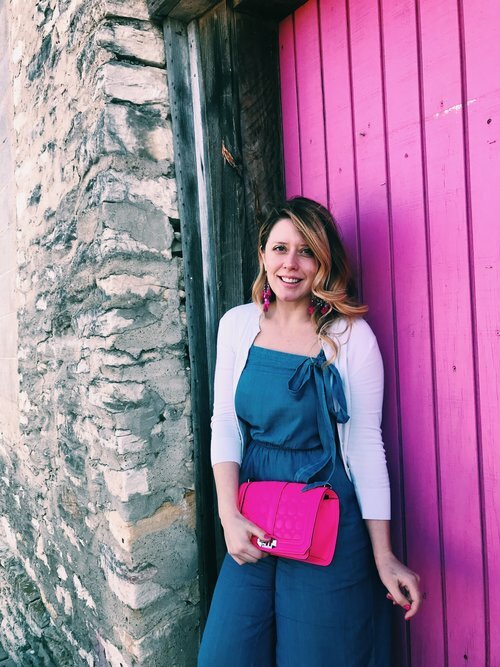 The feminine bright pink contrasts nicely with the utilitarian look of chambray instantly making this a date worthy outfit perfect for Valentine’s Day! Add a pair of pink espadrilles or flats for a casual look and a cute purse. This outfit screams transitioning into Spring. If you are thinking about a picnic date or even a stroll through a pretty garden and live in a warm climate this is an easy way to feel breezy and chic. Wear an eyelet lace top with a simple skirt for a relaxed almost beachy look. Then, add pink earrings and a swipe of bright lipstick to tie in all of the pink accessories. From dinner to cocktails wearing a beautiful long sleeve maxi dress gives a certain drama shorter versions do not. Make sure you find one that’s fitted in the shoulders and has sleeves that show off your wrists so you don’t overpower your frame. A skinny belt in a hue that doesn’t contrast but instead compliments the tones of the dress keeps the dress elegant but not over the top. For this look, wear your hair in bohemian braids or off your face in a bun to let the dress take center stage. If you choose a dress on the simpler side then it’s nice to mix and match patterns on your accessories to give the outfit a special flair. Here a silk scarf was used to tie around the waist and then a striped clutch with pink trim was added. Also, instead of opting for matchy matchy shoes, try a fun floral (like I did in yesterday’s post). This is perfect for an evening out, but is also still modest enough to wear to work for the day. So this outfit is high drama! Be ready to get a ton of compliments (because who doesn’t love a tulle skirt?) and it’s perfect for a fancy night out. If you are going with a skirt with this much volume pair down the top and wear a body suit or a fitted bodice. Add simple gold accessories like sandals and a clutch or a brooch for an extra embellishment.